There’s an armada of adventurer tourers heading to India. Hero MotoCorp, this fiscal, will introduce two variants of its Xpulse – Xpluse 200 and Xpulse 200T. Later in 2019, we expect to see the KTM 390 Adventure arrive in the Indian market. 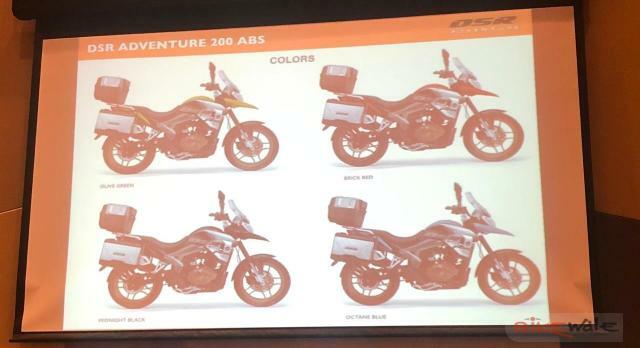 In more updates, Bikewale has reported images, features, colour options and price of a new adventure tourer, the UM DSR Adventure 200 ABS. The UM DSR Adventure 200 ABS will be launched in four colour options – olive green, brick red, midnight black and octane blue. The motorcycle will come with optional accessories for enhancing its touring capabilities. A tall pointed beak may resemble that of an off-roader, but the UM DSR Adventure 200 will be a road-focused tourer. Thus, the motorcycle will come equipped with 17-inch alloy wheels instead of a larger front unit – a trait for off-road spec motorcycles. Alloy wheels would come with the convenience of tubeless tires. Moreover, the engine features a plastic cowl instead of a proper steel bash plate. A tall windscreen will offer solace against windblasts at highway cruising speeds, thus enhancing the rider comfort. The 14-litre fuel tank promises a decent range between stops. The bike gets a low seat height of 780 mm that would make it more accessible to short riders. The motorcycle will come with comprehensive luggage solutions as optional accessories. The bike was photographed with panniers and a top box. Surprisingly, apart from the regular crash guard, the motorcycle also featured a protector at the rear. The leaked presentation reveals that the UM DSR Adventure 200 ABS will be available in four colour options – olive green, brick red, midnight black and octane blue. Stopping power will come from disc brakes while the safety net will include a single-channel ABS. Propelling tasks would be performed by a 196cc, single cylinder, 2-valve, air-cooled, carburettor motor that delivers 16 bhp of maximum power at 8,500 rpm and 16 Nm of peak torque at 6,500rpm. The engine will come with a six-speed gearbox. The UM DSR Adventure 200 will get a single-channel ABS. The motorcycle will be priced at INR 1.39 lakh (ex-showroom). The leaked slideshow also revealed the price of the upcoming motorcycle. The UM DSR Adventure 200 ABS will be available at INR 1.39 lakh (ex-showroom). 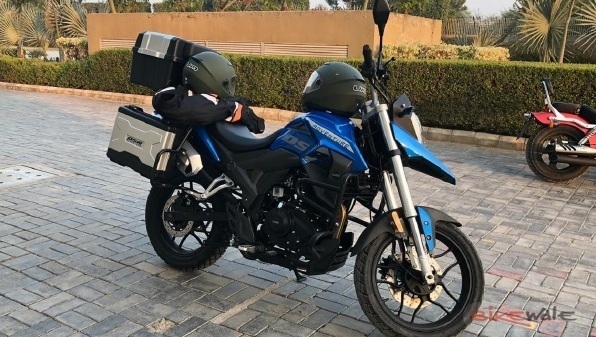 The engine specifications put it directly against the Hero MotoCorp’s Xpulse 200, but that model is expected to arrive around the INR 1 lakh price range.